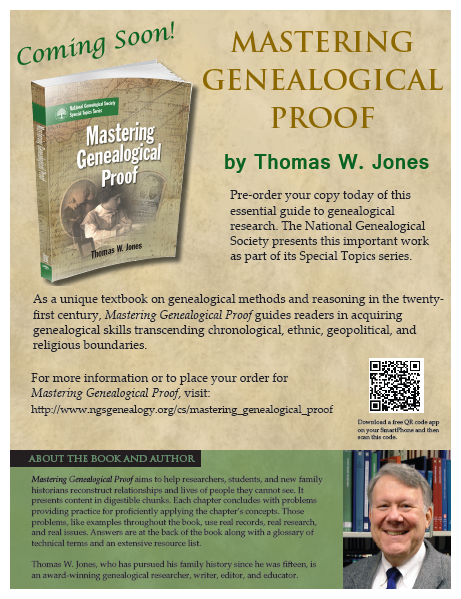 I am so excited for the release of Tom Jones' new book Mastering Genealogical Proof. He has written a "textbook" with explanations and practical exercises on how to understand and apply the Genealogical Proof Standard (GPS). He breaks down the GPS with a thorough discussion of each element and then invites the reader to practice the skills taught with real problems and answers. I think this immediate practical application of the knowledge gained is an excellent educational process. You can pre-order a copy of Mastering Genealogical Proof here. The ship date is listed as approximately May 20th, but I assume that there will be copies available at the National Genealogical Society (NGS) Family History Conference in May, as NGS is the publisher of this new book. I will be organizing groups to study this new text and will post information as soon as the group format and registration process are established. If you are interested in mentoring a study group, please send me a message. If you are interested in participating in a study group, please wait for further instructions. Tom Jones is a masterful teacher and I am very excited for more genealogists to learn from him as they study this new book. For more information on the book, a link to the full table of contents, and a sample exercise, click here. Thanks for the heads up +Angela. So many people I know don't understand the GPS this book will be a must have! I've been waiting for this since we discussed it at SLIG. You can sign me up for the study group! I really hope this will be offered as an ebook too.